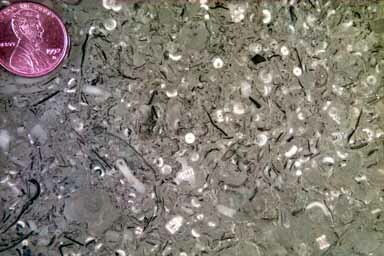 Micrite = lime mud; CaCO3, the mineral calcite surrounding and supporting skeletons, mostly of crinoids (white fragments) and brachiopods (black, curved fragments), although bryozoans and other organisms are present. Micrite is the equivalent of clay (rock = shale) in clastics. See Origin of Micrite for more details. Saw cut slab of limestone, wet with water before being photographed. Black and white objects are cut sections of fossils. The white pieces are mostly crinoid stem fragments. Crinoids stems are cylindrical columns made up of discs strung together like a stack of poker chips. Sometimes they appear round when the stem has been cut across the axis, while longitudinal cuts are rectangular. The curved black fossils are cross sections through brachiopods or trilobites. The light gray areas are the unform, dense micrite. Carbonates of all types are commonly associated with regions of tectonic stability and tropical climates, that is no mountain building, and stable, shallow water environments associated with continental shelves or epeiric (epicontinental) seas. Go to Carbonate Tectonics for more explanation. This rock was deposited in a shelf environment in an epicontinental sea (one lying on a continent). The water was quiet for the most part, as indicated by the abundant micrite matrix, but was a rich place for life as indicated by the abundant fossils. As the animals died their skeletons would accumulate on the bottom, and be slowly buried by the micrite.